“One step beyond” is what the Milwaukee Journal Sentinel and reports in the national media would have you believe. But Governor Scott Walker’s policies and actions are too many steps beyond. There is one person responsible for the recall of Wisconsin’s governor, and that person is Scott Walker. His and his party’s lockstep march to alter our laws and policies regardless of the public response has resulted in this mess. The concept of legislative compromise seems alien in our state and country at this time, even though polls suggest a large majority of the public want compromise. I have not been supportive of government by recall. But I signed the petitions. 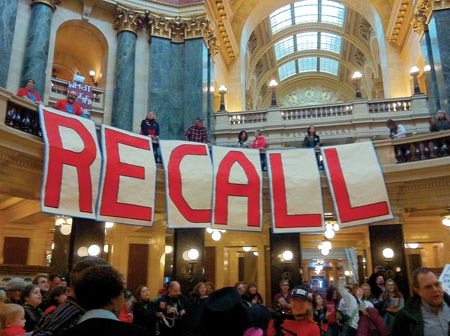 To the Journal Sentinel’s credit, a recent editorial noted that one million recall signatures is democracy in action and deserves respect. I am sure much of what Walker wanted could have been achieved without eliminating collective bargaining for government employees. The governor removed those rights for most of the 175,000 state and local employees in Wisconsin, allowing workers to negotiate only over salary, and only in a limited way. Walker exempted most law enforcement and firefighters from the change in collective bargaining. The governor claimed public safety as the reasons for the exemptions, but many saw it as pandering to law enforcement groups that supported Walker in the election. If the public had known that Walker would be taking this step before the election, I do not think he would have won. This is only made worse by staunch Republican and Tea Party folks referring to union leaders as “thugs.” They bemoan the political power the unions have through the money raised by dues. They belittle teachers, inferring that they do not know what is in their best interest and are being fooled by the union leaders as if they were uneducated. I am not in a union, but I believe unions are one of the few ways for common people to have a voice in government. Since corporations are now considered to have the rights of individual citizens (by Supreme Court decision), our country has become an oligarchy with only the wealthy having a voice in government. Walker did take the fake call from someone he believed to be David Koch, his rich out-of-state supporter. He has not seemed interested in talking with the one million people who want him recalled. Yes, union bashing is a key component in the disaffection with Walker, as it should be. But there is more. The state of Wisconsin successfully won federal money for high speed rail to Madison that was going to be part of a midwest train system linking Chicago to Milwaukee, Madison and Minneapolis. Walker rejected the years of work that went into this vision for a future that would have reduced our dependence on cars. Such short sighted leadership cost us an important forward-looking piece of infrastructure that would have created jobs in Milwaukee and given Wisconsin alternatives to more freeways. It is as if Walker somehow thinks there is no oil crisis. He acts like we live in a world of infinite resources and it is our right to squander them. This is why I signed the recall petition. Snide remarks about “choo-choos” from right wing pundits do not resonate with many in our state who look to alternative means of transportation to provide a sustainable future. We cannot buy “caring.” However, the state does have a role in regulation that protects consumers and provides access to a health system that is open to all. Employee health coverage is failing. Health care costs are out of control. Millions are left out of the system, which ultimately adds to the cost for us all. Walker, playing politics again, rejected a $37 million federal grant that could have been used to set up a Wisconsin Health Insurance Exchange. Walker is hoping the Supreme Court strikes down the Affordable Care Act passed by Congress and signed by the president. Dogma again trumps the best interests of the citizens of Wisconsin. To be fair, I don’t believe politicians can do much about the economy, especially on the state level. But Walker promised he would create 250,000 jobs in four years. That seemed like something that would happen easily if the national economy rebounded even moderately. So far the state is losing more jobs in the private sector than it’s gaining. The public sector is shedding jobs. Teachers are being laid off per Walker’s plan. Did I mention the loss of jobs in Milwaukee’s central city that would have been created by the high speed rail to Madison? Ok, we will use Walker’s own yardstick. He’s failing. I suppose he will point to the state of unrest caused by the recall as the reason businesses are not expanding. He could have done something about that. So far Walker has taken an attitude of reducing environment protections so business can build and expand faster. This includes possible mining operations in the north. Caution! We can’t recover what is lost when we are so anxious for jobs that we lose sight of our natural resources. Fragile ecosystems need protection and Wisconsin historically has been in the forefront of conservation and environmental protection. This attitude has been bipartisan in the past and should continue to be supported by both parties. I might give the same advice to Walker, should he be successful in winning what seems like an inevitable recall election. For what it’s worth, here’s my advice. Change your tone. Invite the other side in on decisions and understand that compromise gives voice to all the people of Wisconsin. Democrats need to pick a candidate with state-wide appeal. Run a campaign that promises to work with the opposition. Stop the name calling and offer forward-thinking ideas that can be accomplished in a fiscally-tight era. Pick a candidate soon. Move away from just union-centered issues. Emphasize jobs in both the private and public sectors as being important for the success of Wisconsin.